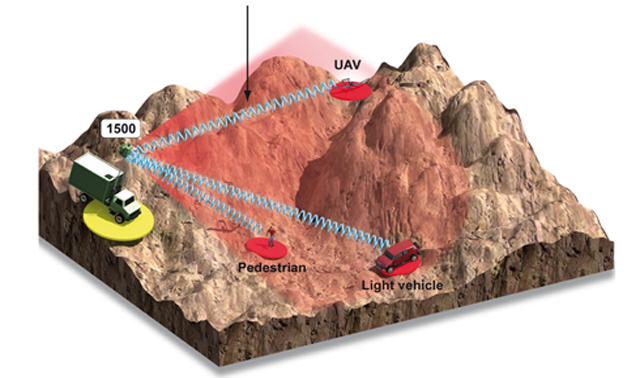 SPEXER 1500 is a high-performance radar specifically designed for the surveillance of large perimeters and border control, particularly in areas constrained by mountains or other geographical elements. It is a part of the proven SPEXER security radar family, which has demonstrated its unmatched performance in regions across the globe, and is derived from the SPEXER 2000 border surveillance radar – an industry leader in terms of operational capabilities. With a smaller size and lower weight than the SPEXER 2000, the SPEXER 1500 radar is highly portable. This allows for its flexible use in a wide variety of security scenarios while deployed as a land-based fixed installed system, integrated in a smart vehicle or mounted on a tripod. It combines the surveillance of ground, sea and low air space, and is capable of working under harsh climatic conditions where competing sensors could fail. For increased protection against the elements, the radar also can be outfitted with an optional air-conditioned radome. Due to its use of Active Electronically Scanned Array (AESA) technology, the SPEXER 1500 replaces conventional mechanically-rotating reflector antennas for security applications, and facilitates high operational performance. The AESA technology provides a dual-beam capability that offers the functionalities of two separate conventional radars in one easily portable solution at a competitive price. This multi-tasking capability overcomes the classical limitations of radar systems, and enables the simultaneous use of target tracking and sector surveillance. As a result of its electronically-scanned technology, SPEXER 1500 produces better operational performance for the detection of slow-moving targets such as pedestrians.